Bundesliga | Robert Lewandowski created more Bayern Munich history while Bayer Leverkusen can't stop scoring: It's the Matchday 20 statistical breakdown! Robert Lewandowski created more Bayern Munich history while Bayer Leverkusen can't stop scoring: It's the Matchday 20 statistical breakdown! 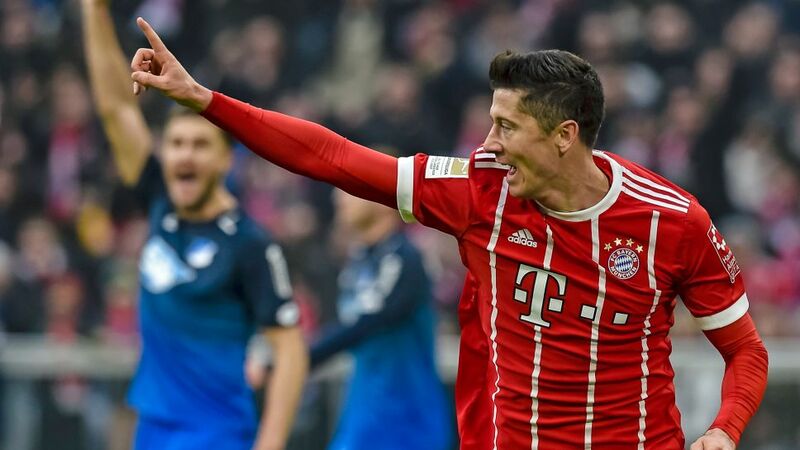 Robert Lewandowski continues to feel right at home in Munich, Bayer Leverkusen can't stop scoring this season and Naldo is the leading Brazilian star on a Bundesliga weekend packed with numbers. For the first time this season, Hamburg came from behind to claim a point in the league. Julian Nagelsmann suffered his first league defeat against Bayern Munich at the fourth time of asking, having won two and drawn one of his previous three meetings. Augsburg’s Caiuby scored his fifth goal of the season on Saturday to set a new personal season record, having never scored more than four goals in a single top-flight season. Wolfsburg are unbeaten in their last seven matches against Lower Saxon neighbours Hannover (four wins, three draws). Freiburg are currently on the longest unbeaten run – eight matches (four wins, four draws) – of any team in the league. After defeat on their last nine trips to Dortmund, Freiburg claimed their first point in more than 16 years at the SIGNAL Iduna Park. Kryiakos Papdopoulos received his ninth caution of the season at Leipzig on Saturday and is now the most booked player in the division. Interestingly, new HSV coach Bernd Hollerbach ended up as the Bundesliga’s yellow card king for three seasons between 2001 and 2003. After Jupp Heynckes, Gerd Müller, Pierre-Emerick Aubameyang and Thomas Christiansen, Robert Lewandowski has become the fifth player to score in ten consecutive Bundesliga home games. The Pole has scored in every match at the Allianz Arena this term. Bayer Leverkusen have scored in their last 25 matches to set a new club record following Sunday’s win over Mainz. Milos Jojic finally scored in the league this term with his 29th attempt against Augsburg on Saturday. Leverkusen’s Wendell scored the 50th spot-kick of the league season so far (from 63 penalties awarded). Bayern’s seventh league win in a row was also victory no.333 for Jupp Heynckes as a Bundesliga coach and no.150 in charge of the Bavarians. Naldo made his 337th Bundesliga appearance in Schalke’s win at Stuttgart on Saturday, supplanting compatriot Ze Roberto as the leading appearance-maker among Brazilian players in Germany’s top flight. Watch: Naldo: "A special day for me"